Vocational and trade education is a fundamental part of Arkansas’ secondary school system, and the hands-on career training available at vocational and trade schools allows students to further their educations at the post-secondary level. With a high school system containing career and technical training at its core, early college programs, vocational centers for teen and adult learners, comprehensive community and technical colleges all prepare Arkansas trade students for high demand careers in fields like education, health and business. Keep reading for more information on career opportunities and vocational and trade schools in Arkansas. Arkansas offers an excellent selection of trade and vocational schools for those looking for professional training. Specialized forms of training are available from a variety of institutions, such as community colleges and career schools, where students often receive training from areas in allied health, education and agriculture. Our ranking of Arkansas trade and vocational schools takes into account tuition rate, financial aid and more. Learn who made the list of the Top Vocational and Trade Schools in Arkansas for 2016-2017. With more than 40 programs leading to certificates and certificates of proficiency, North Arkansas College delivers vocational training in business, technology, law enforcement, allied health care, construction, agriculture and engineering disciplines. Technical certificate programs require 24-42 undergraduate credit hours for completion. Certificate of Proficiency programs provide benchmarks career knowledge in a professional skill, requiring 7-18 undergraduate semester credit hours. Wide-ranging areas of study include accounting, automotive technology (gas engine and collision repair), information technology (digital media, networking, software development), heating, ventilation, and air conditioning, small business management, crime scene investigation, emergency medical technician, nursing assistant, and welding. Arkansas Northeastern College complements its career certificate programs by arranging internships to help students integrate their learning with hands-on workplace experiences. ANC’s educational divisions serve the needs of students in allied health, allied technologies and in the arts and sciences. Technical certificate programs in allied health prepare students for positions in practical nursing, dental assisting, phlebotomy, emergency medical services and patient-care technology. The allied technology division has certificate of proficiency programs in welding, HVAC, construction technology, criminal justice, advanced manufacturing and in general aviation. Each certificate of proficiency program requires from 7 to 18 hours of coursework for completion. Allied health, business, information systems, and industrial arts lead the way in Northwest Technical Institute’s vocational diploma programs for working adults. Diploma programs in health include studies for practical and certified nursing assistants and in surgical technology. Business diploma programs focus on information systems, while the industrial arts department offers diploma programs in automotive technology, collision repair, diesel and truck repair, welding and ammonia refrigeration. Through NTI’s articulation partnerships with community colleges in Arkansas and Missouri, students can apply credits from their vocational diploma coursework toward an associate’s degree. All students have free access to Credo Reference, an online reference database. College of the Ouachitas’ Career Center helps high school students to get a vocational kick-start through concurrent enrollment in courses earning college credit. The occupational programs are in automotive technology, basic industrial maintenance, criminal justice, cosmetology, medical profession education or welding, meeting five days a week for two hours per session. The Workforce Alliance for Growth in the Economy at College of the Ouachitas offers six certificate programs with vocational training in customer service, bank teller operations, office technology, and industrial labor. All students in these programs gain computer literacy and job-readiness skills. Individual courses include CPR - BLS, welding, and massage training. The University of Arkansas Community College at Hope-Texarkana is an accredited two-year school providing students with technical certificates and certificates of proficiency in business, healthcare, information technology, and manufacturing. Certificate programs require 30 credits of study in the vocations, including child development, emergency medical services, funeral directing, heating, ventilation, and air conditioning, industrial technology (machining, mechanical), supply chain management, and practical nursing. Through its partnerships with other institutions specializing in law enforcement training, UACC offers certificate programs in crime scene investigation, and law enforcement administration. Qualified students enrolled in an Arkansas public or private high schools can take UACC courses as part-time students. Arkansas’ education system emphasizes career and technical education (CTE) at the secondary level, which means high school students can prepare for vocational and trade careers early. Arkansas’ Smart Core program, a set of college- and career-focused courses, is the state’s default curriculum for all public high schools, and every public school district is required to offer at least three CTE programs from three different career pathways. Secondary students also have the option to attend Arkansas’ Secondary Area Career Centers, which provide vocational programs smaller schools often can’t afford. Postsecondary students can find vocational and trade schools through Arkansas’ community college system, or they can attend one of three technical institutes. To learn more about different vocational and trade schools in Arkansas, prospective students can use this search tool. Every Arkansas high school student has the opportunity to gain career and technical education from their traditional, district school. In the 2013-2014 school year, 96.4 percent of Arkansas’ secondary CTE students graduated. The technical skill attainment core indicator for postsecondary Arkansas students was 6.6 percent higher than the national average. Secondary career and technical enrollment is almost evenly split between males and females in Arkansas. Arkansas vocational and trade students earn almost as many one-year and less-than-one-year certificates as they do bachelor’s degrees, likely with the help of Arkansas’ comprehensive secondary CTE programs and numerous less-than-one-year vocational programs offered through technical institutes. Vocational and trade students can also earn associate’s degrees, either through community colleges, technical postsecondary institutes or even through high school programs. The table below shows how the breakdown of credentials earned at vocational and trade schools in Arkansas compare with those earned nationally. After a significant 1.3 percent drop in unemployment between 2013 and 2014, Arkansas’s unemployment rate continues to decrease. While those who go into a health or business vocational program can expect positive job prospects in these growing industries, services-providing industries are projected to provide the majority job growth statewide, netting 119,757 jobs between 2012 and 2022. In 2014, 22 percent of Arkansas’s labor force worked in either education or health services, and growth for those industries continues to look good. Healthcare and social assistance is expected to grow 23 percent by 2022, and education services is expected to grow 13 percent. Many careers with the most annual job openings in Arkansas fall under these fields as well. The table below lays out which occupations have the most job openings in Arkansas and their median annual wages. The information is divided by jobs for those with some college experience and those with associate’s degrees. Most vocational and trade schools in Little Rock are private, mid-sized colleges. There are two not-for-profit schools—Baptist Health College and Remington College—and two for-profit schools—Heritage College and Eastern College of Health Vocations. Little Rock’s only community college happens to be specifically geared toward technical education: Pulaski Technical College has programs of study in healthcare, education and human services, business, information technology, culinary arts, hospitality management and technical and industrial programs. Pulaski Technical College also has university transfer programs for students who want to continue their educations at a four-year university. The fastest growing industry in Little Rock is machinery manufacturing, while professional and business services are projected to lead in net job growth. Little Rock hospitals are expected to lose jobs; however, they are currently Little Rock’s top employers, supplying 19,415 people with jobs, and even with the job losses, hospitals will still be the city’s largest employers. Career and technical education advocacy association that promotes and supports the growth of vocational education in Arkansas and provides information about Arkansas’ CTE programs, including legislative initiatives and policies. Division of the Arkansas Department of Education that oversees career education, including adult education, career and technical education and rehabilitation services. 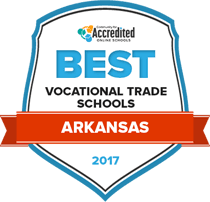 Comprehensive resource for information about vocational and trade education in Arkansas’ school system. Provides a variety of resources related to Arkansas’ workforce, including information about career training, employment, and the state’s labor market. A college and career planning system to help Arkansas students learn about potential careers and the education necessary to get them. Labor market information resource for Arkansas. Includes current employment data, industry and occupation projections, and helpful guides for individual vocational career clusters.